1. Session storage - The data only availble for particular session. The proxies in Ext JS are used for performing above operation. There are three kind of client side proxies available in Ext JS. These proxies are directly used by either in models or stores. Let's see an example for above proxies. The session storage data is only available for particular session. Once the browser has closed, the data will be lost. I am going to store/read some basic information of the user like user name and display name by using session storage. Let's create a simple model for user and we can reuse this model in various stores. Let's create a session storage store. Here the proxy type "sessionstorage" indicates, the data is storing into session storage. The id property is a key for storing/reading values to/from session storage. Let's create a session storage controller and will see how to store a value and read a value by using session storage. //Here records is a array type. For testing purpose, I took first record. The result of the above code is as shown below. The local storage data is available for long time (until removing data from local storage memory) and we can share the data between various browser/tabs. Let's create a local storage store. Note : the proxy type of the store. Let's create a local storage controller for testing above store. //Getting handle of local storage store. Memory proxy is very useful whenever you want to store the data temporally. The data will be lost on every page refresh. For an example, in my application I need to display list of countries to users for selection purpose. In this situation we can use our memory proxy concept for displaying country list. In future we want to add some more countries than, there is no need for modifying our existing code. Le's create a model for country. 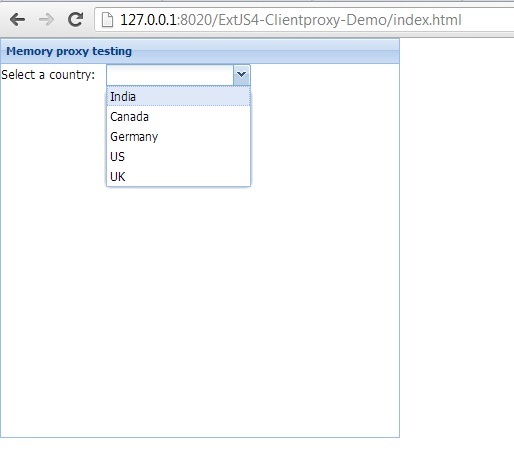 Let's create a store for country model, here check the proxy type. Let's create a combobox for testing above store. Note: I am following MVC pattern and this is my country view. Let's create a controller for memory proxy and in controller init function, render our view into HTML body. Finally, this is my app.js code. The result of the above code is as shown in figure.